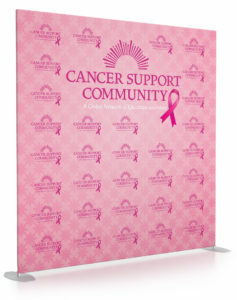 Large format free standing banner stands deliver a great representation of your brand or message. Free standing units are available up to 12 feet wide and 10 feet tall. Designed to fit inside any space with adjustable vertical and horizontal components. Additionally, fabric graphics can be suspended on the frames with pole sleeves or constructed with stretch fabric to pillowcase over the free standing frame. Each stand is delivered in a nylon carry bag where all the parts fit snugly into the inside pockets. 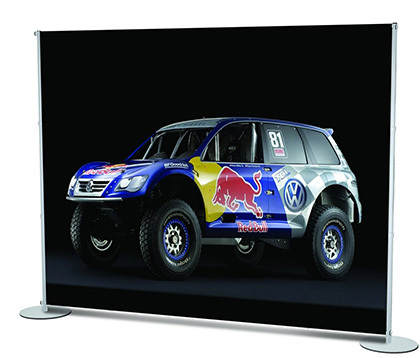 Create a custom backdrop at an exhibition or event with large format banner stands. 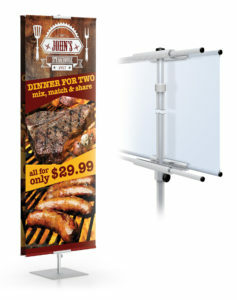 Display promotional banners inside a store or museum with portable banner stand units. Construction: Hardware on all styles is fabricated with lightweight aluminum tubing and push button attachments connect the parts together. Conversion kits are required for larger units. Hardware comes in matte silver finish or black. Imprint: Graphics are created with dye sublimation printing onfabric 120″ wide seamless construction. Production: Relative to order size. Small orders 1-2 weeks. High volume orders 3-5 weeks depending on order size. Rush service is available. Accessories: Clip on light options are available. Hard cases available for travel. 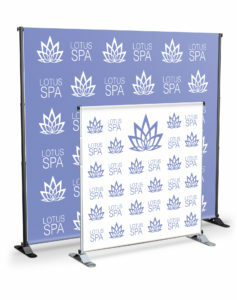 Additional Information: Click “view our catalog” link below to page through the different large format banner stand styles. Additionally, use the sample request form below to receive a printed fabric swatch of the graphic via US Mail.